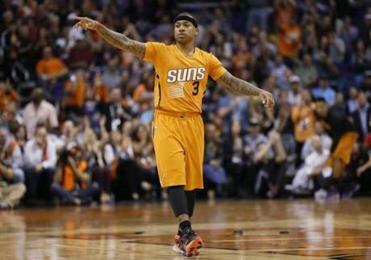 Isaiah Thomas was averaging 15.2 points for the Suns. SACRAMENTO — After the Celtics finished practice at Sleep Train Arena on Thursday afternoon, they gathered near midcourt and reached their hands in as one. “One, two, three, together,” they said in unison. But at that moment, like so many others in recent months, the Celtics were not together. Two teammates had departed and three new ones had yet to arrive, as this ever-changing roster neared its latest iteration. After a quiet lead-up to Thursday’s 3 p.m. trade deadline, Celtics president of basketball operations Danny Ainge closed with a flourish. Boston traded guard Marcus Thornton and a 2016 first-round draft pick previously acquired from the Cleveland Cavaliers to the Phoenix Suns in exchange for guard Isaiah Thomas. In a separate deal, the Celtics sent 34-year-old forward Tayshaun Prince to his original team, the Detroit Pistons, in exchange for forwards Luigi Datome and Jonas Jerebko. The Celtics also created a $7.7 million trade exception as part of that transaction. A closer look at the player the Celtics acquired at the NBA trade deadline on Thursday. “I’ve got a lot of work to do,” said Celtics coach Brad Stevens, who was unable to speak directly about the trades because they had not been officially announced. The Celtics entered the All-Star break just 1½ games out of the Eastern Conference’s final playoff spot, sparking questions about how this rebuilding team should approach the trade deadline. Ainge was wary of hindering long-term goals or breaking up the young core, and with Thursday’s deals, he did neither. Thomas, who is averaging 15.2 points and 3.7 assists in 25.7 minutes per game this season, is the most notable piece in either trade. He is just 26 and is in the first year of a manageable four-year, $27 million contract. The Celtics pursued Thomas during free agency last summer and he spoke highly of their overtures. Now, the sides are united. Thomas will help form a young, talented backcourt that includes rookie Marcus Smart and Avery Bradley. It is somewhat noteworthy that the team traded for a young point guard less than a year after using the sixth overall draft pick on Smart, but Ainge wants backcourt depth. Furthermore, the 5-foot-9-inch, 185-pound Thomas and the 6-4, 225-pound Smart have different skill sets and physiques. On Thursday afternoon, Smart told the Globe that he welcomed the move. The Prince deal was less stunning, as the veteran was expected to agree to a buyout if he was not traded before the deadline. Jerebko, 27, is a 6-10 forward from Sweden who was averaging 5.2 points in 15.3 minutes per game with the Pistons. He has a $4.5 million expiring contract. Datome, 27, had played 17 minutes over three games for Detroit this season. The Prince trade should lead to more playing time for rookie forward James Young. At the Celtics’ practice, news of the trades was met with varying reactions. Excitement about the additions was mixed with some sadness about seeing teammates depart, and the reality that this industry can be fickle. Stevens praised Thornton for his hard work and Prince for being “the ultimate pro.” But the prevailing emotion on Thursday was relief. Now, the seemingly unending rush of transactions should slow, and the Celtics can focus their energy on basketball. While the addition of Thomas could bolster Boston’s postseason chances, other teams chasing the Eastern Conference’s final two playoff berths improved on Thursday. 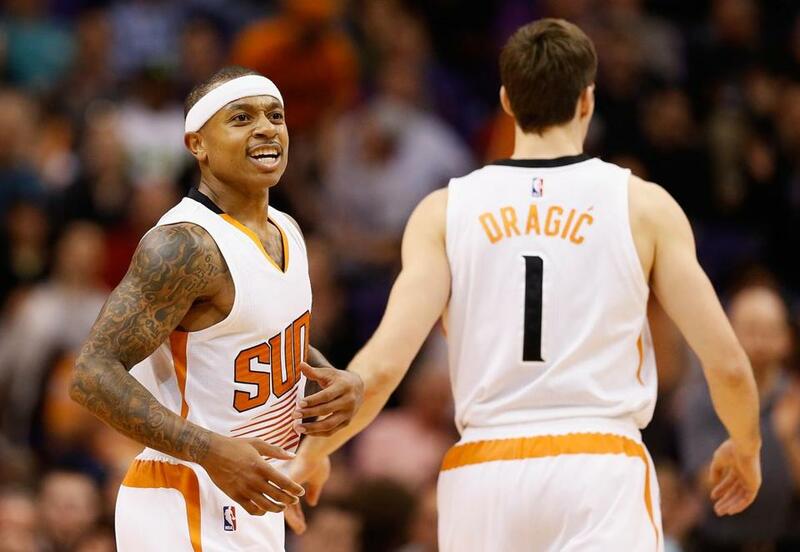 The Heat acquired Suns point guard Goran Dragic, and the Pistons traded for Oklahoma City guard Reggie Jackson. Also, the Celtics will begin their West Coast trip against the Kings on Friday without leading scorer Jared Sullinger, who is out with a foot injury. Nevertheless, the deal for Thomas was not made to hastily chase a playoff berth; it fits Ainge’s long-term vision for this team. Sullinger will be sidelined indefinitely with a stress reaction on a bone in his left foot, Stevens said. A prolonged absence would be a significant blow. Sullinger, who is averaging a team-leading 14.4 points and 8.1 rebounds, began to experience discomfort during the Celtics’ win over the Hawks Feb. 11. The pain returned during Wednesday’s practice, and Sullinger removed himself from the workout. X-rays revealed the injury on Thursday morning, and Sullinger returned to Boston Thursday night for further evaluation. He is not expected to need surgery. Kelly Olynyk (ankle) took part in light drills on Thursday but is not expected to play Friday. Adam Himmelsbach can be reached at adam.himmelsbach@globe.com.